Adapting a memoir for the big screen can get complicated, especially if the story involves harrowing circumstances that could make one question the genuineness of what's happening. For the sake of pacing or achieving a certain rating, the writers handling the screenplay may choose to excise crucial or outlandish details; for the sake of character development or achieving a cohesive tone, certain elements might also be expanded upon. Therefore, giving a pass to a film's credibility simply for its roots as a true-to-life memoir isn't such a straightforward thing. Short Term 12 revealed that writer/director Destin Daniel Cretton understands how to authentically capture the intensity of a traumatic childhood, boding well for his adaptation of The Glass Castle, Jeannette Walls' recount of her family life plagued with homelessness and alcoholism. While powerful, well-crafted, and driven by a raw and versatile performance by Brie Larson, the director's third feature-length effort can't keep the sheen of cinematic melodrama under control, producing a ramshackle tearjerker with some gaps in the remembering that'd help it along. The "glass castle", also the name of the novel, refers to a fanciful dream home constantly being blueprinted and promised to be built by family patriarch Rex Walls (Woody Harrelson), an intelligent, skilled engineer and manual laborer. His insistence on independence and bouts with alcoholism prevent him from doing so, though; his inability to hold down a job and his need to escape from creditors force him and his family -- his wife, Rose Mary (Naomi Watts), and four children -- to live as nomads, traveling between rental homes and squatting in others that have been abandoned. Despite the harsh limitations of this lifestyle, second-eldest child Jeannette Walls (Brie Larson) ultimately makes it out of the situation, as seen by how the story transports ahead many years later to when she's become a renowned gossip journalist and fiancée to a wealthy financial professional. The Glass Castle reveals how she engineered her escape from her destitute conditions to this New York lifestyle, and how the troubles of her past both figuratively and literally followed her to the big city. In its cinematic form, The Glass Castle is constructed with nonlinear storytelling throughout, jumping between the turmoil of the Walls' hard-living years to Jeannette's stable yet emotionally burdened adulthood. These two narratives also move forward normally and in lockstep with one another, and in the process Destin Daniel Cretton -- teaming up with co-writers Andrew Lanham and Marti Noxon -- swiftly establishes certain before-after expectations to the film's layout based on Jeanette's escape and her father's fluctuating alcoholism. Cretton cleverly operates in meeting points and the vague knowledge of what's coming up in either the near or distant future, which, considering the Walls' constant state of impoverishment and fear of whatever state Rex might be in, successfully gives the film a progressive and mostly melancholy type of expectancy. That said, the script also tends to over-explain during dramatic endeavors while leaving out more mundane, yet difficult details of the Walls' complex life, combining into a depiction with an expressive agenda instead of one focused on realistic hardship. The depiction of the Walls' lifestyle shares a few similarities to last year's Captain Fantastic, in which an alternative family -- led by an intelligent yet volatile patriarch -- concentrates on homeschooling, meager means and self-sustainability as they perpetuate a rustic vagabond existence. Once Rex's drinking come into play, however, The Glass Castle takes on a different attitude, commanded by familiar tones involving children threatened by deadbeat parents in destitute conditions. Destin Daniel Cretton tries to keep up with an evenhanded portrayal of alcoholism through Woody Harrelson's gritty performance, depicting Rex's menacing and narcissistic attributes alongside his flickers of consideration for his family, mostly during holidays and when he's in trouble. The lengths in which the film goes to stress the danger posed to his family crosses certain boundaries, though, to such a point that any attempts to highlight his merits struggle under the weight of degeneracy. It's a symptom of the big-screen adaptation: the balance of a nuanced portrayal gets thrown off by the need to enhance necessary overtones. Jeannette's youth takes up a substantial amount of time in The Glass Castle, but most of the story's thematic interest comes in how older Jeannette resolves her attitude toward her past and her parents, which, along with the quasi-flashback nature of it all, justifies the nonlinear design of the narrative. It also spreads out and makes ample use of Brie Larson's talents, who brings a similarly wide-eyed rawness and somber resolution to Jeanette that she did in Room. This is a challenging role, one that involves a lot of internalization and evolution of her character, from her desperate ambitions of her early years to the hollow routine she falls into with her wealth-driven fiancée. 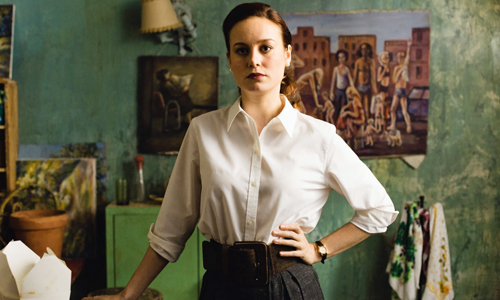 Larson elevates The Glass Castle by injecting specific personality into all facets of Jeanette, especially the subtleties of her tolerant, yet determined attitude; sharp flips in her personality, like when she defends her Chinese dumplings with chopsticks during a meal or how she caves into the feral attributes of her old self while encouraging her husband, transform into some of the film's most notable moments. Neither Larson's portrayal nor Destin Daniel Cretton's focus on the intimacy and power of conversations -- which served him so well in Short Term 12 -- can fully realize the true-story potency of The Glass Castle, growing more complicated as Jeanette's story approaches foreseeable moments of catharsis. Themes of forgiveness and coming to grips with one's past are involved that, despite an earnest effort from the director to follow-up on his previous film's success, struggle to make sense with everything that happens beforehand, and the abridgment and cluttered merging of past and present story threads bear the responsibility. Daniel Cretton pays close attention to the progression of events in Jeanette's past, but the same attention isn't paid to arguably more poignant scenes in her present, in which significant phonecalls, reunions, and changes in viewpoint latch onto emotions that aren't earned in their neglectful buildup. The urge might be there to cut The Glass Castle some slack for its attempt at sentimental consideration of all sides of coping with self-destructive loved ones, but much like Rex's blueprints for the ideal household, it's a pursuit that lacks the grounded wherewithal to make it happen.